I have been attempting to move from a regular SQL Server on a Win2008 Server to the SQL Server on Amazon AWS RDS. And the also gave me an unofficial wink at the Azure database migration tool. Just use it to generate a script of your schema and or data and execute it against your RDS instance. Its a good tool. You will have to import the .bak into a non-RDS SQL server first to do this. I wrote up some step-by-step instructions on how to restore a .bak file to RDS using the SQL Azure Migration Tool based on Lynn's screencast. This is a much simpler method than the official instructions, and it worked well for several databases I migrated. You will probably find that the Data-tier Applications BACPAC format will provide you with the most convenient solution. You can use Export to produce a file that contains both the database schema and data. Import will create a new database that is populated with data based on that file. In contrast to the Backup and Restore operations, Export and Import do not require access to the database server's file system. You can work with BACPAC files using SQL Server Management Studio or via the API in .Net, Powershell, MSBuild etc. Note that there are issues using this method to Export and then Import from and to Amazon RDS. As a new database is created on RDS, the following two objects are created within it. A User with membership in the db_owner role. During the import, there will be a conflict between the objects included in the BACPAC file and the ones that are added automatically by RDS. These objects are both present in the BACPAC file and automatically created by RDS as the new database is created. If you have a non-RDS instance of SQL Server handy, then you can Import the BACPAC to that instance, drop the objects above and then export the database to create a new BACPAC file. This one will not have any conflicts when you restore it to an RDS instance. Otherwise, it is possible to work around this issue using the following steps. Edit the model.xml file within the BACPAC file (BACPACs are just zip files). Remove elements with the following values in their Type attributes that are related to the objects listed above (those that are automatically added by RDS). Generate a checksum for the modified version of the model.xml file using one of the ComputeHash methods on the SHA256 class. Use the BitConverter.ToString() method to convert the hash to a hexadecimal string (you will need to remove the separators). Replace the existing hash in the Checksum element in the origin.xml file (also contained within the BACPAC file) with the new one. Create a new BACPAC file by zipping the contents of the original with both the model.xml and origin.xml files replaced with the new versions. Do NOT use System.IO.Compression.ZipFile for this purpose as there seems to be some conflict with the zip file that is produced - the data is not included in the import. I used 7Zip without any problems. Import the new BACPAC file and you should not have any conflicts with the objects that are automatically generated by RDS. Note: There is another, related problem with importing a BacPac to RDS using SQL Server Management Studio which I explain here. 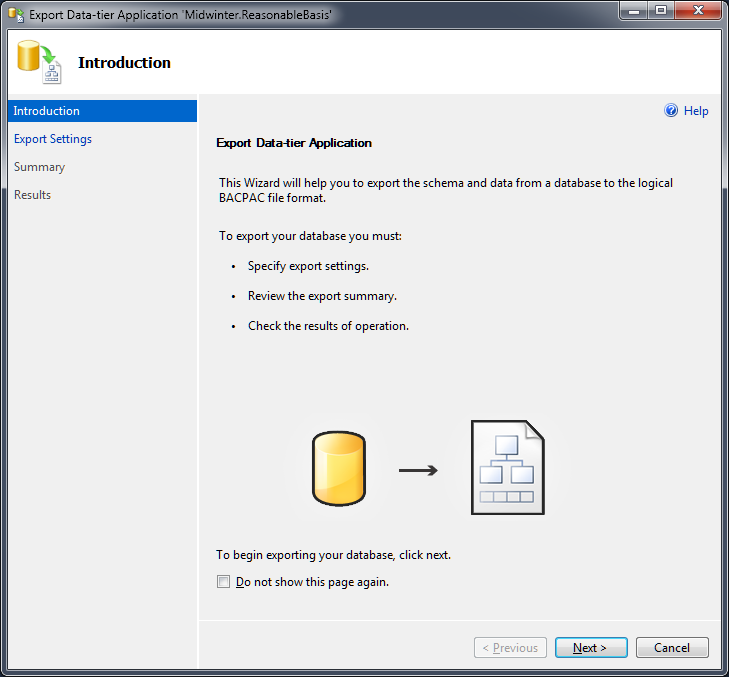 Use the export wizard in sql server management studio on your source database. Right click on the database > tasks > export data. There is a wizard that walks you through sending the whole database to a remote sql server. The following article discussing how to Copy Database With Data – Generate T-SQL For Inserting Data From One Table to Another Table is what I needed. Not the answer you're looking for? Browse other questions tagged sql-server amazon-rds or ask your own question.